Most foods contain all the eight essential amino acids that the body needs for normal biological functioning. Their proportions, however, tend to differ from one food item to another. Thus, foods that contain these amino acids in sufficient proportions are referred to as complete protein foods whereas those with inadequate proportions are called incomplete protein foods. Almost all animal-based foods like seafood, fish, meat, poultry, eggs, milk, cheese, and yogurt contain all the eight essential amino acids. Hence, they are considered as the primary source of complete protein. Nevertheless, if you are looking for vegetarian and vegan alternatives, you would be pleased to know that there are certain plant-based foods, too, that provide complete protein. Before exploring the top complete protein foods, though, you should know about the eight essential or indispensable amino acids that we are talking about. They are: histidine, leucine, lysine, valine, phenylalanine, isoleucine, tryptophan, and threonine. They ought to be included in the diet as the body cannot synthesize them. In addition, infants and growing children also require cysteine, tyrosine, and arginine. Soybeans and all the soy products such as soy milk, tofu, tempeh, and so on are sources of complete protein. Furthermore, unlike most, animal-based foods, soy and soy-based products do not contain high amounts of saturated fats that in turn increase blood cholesterol. In addition, individuals suffering from lactose intolerance, gluten intolerance, and celiac disease can also take this food. It is a vegan-friendly whole grain which is a good source of protein and fiber. Quinoa provides almost 13% of complete proteins. You can get it from the supermarket either in pre-cooked form as a nutritious breakfast cereal or as uncooked quinoa. You can soak the latter in water for one or two hours (removes the bitter tasting saponin coating and makes the grain easy to digest) and then simmer in water for 10-15 minutes. This is another natural, gluten-free source of complete protein. Moreover, it controls blood sugar, prevents heart failure, and reduces the risk of developing diabetes, obesity, and breast cancer. Technically, it is actually a fruit seed, not grain. You can find it in the market in the form of buckwheat flour, groats, and kasha (roasted groats). Consuming raw, sprouted buckwheat is highly beneficial for health. It is a bioavailable complete protein that offers all the essential amino acids in an easily digestible form. Three tablespoons of hemp seeds provide approximately 11 g of protein. 65% of the protein in hemp seeds is globulin edistin, a plasma protein that performs enzymatic functions and improves the natural and acquired immunity of an individual by making antibodies. Spirulina is highly bioavailable blue-green algae containing all the essential amino acids. In fact, it contains 18 out of 22 amino acids and has almost 60% protein. 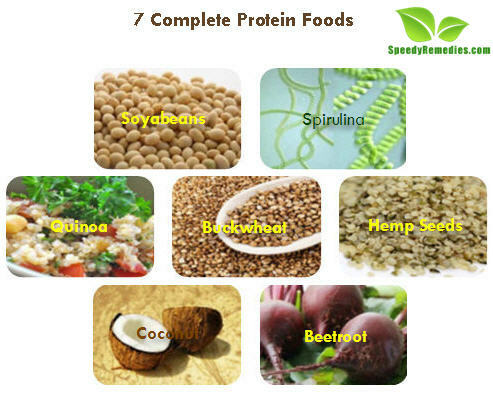 Moreover, it is an easily digestible protein loaded with a number of nutrients. Fresh coconuts as well as coconut milk also contains complete proteins. Coconut globulin is one of the best nut proteins. Among nuts, almonds, pecans, walnuts, and Brazil nuts, too, are complete protein foods. Beetroot contains about 3% complete protein. In addition, it is low in calories and high in antioxidants. Plus, it lowers blood pressure, protects against liver disease, prevents cardiovascular problems, and reduces the risk of osteoporosis as it helps the body utilize calcium. Interestingly, drinking beetroot juice stimulates healthy hair growth. It is considered good for those suffering from anemia and fatigue. Excessive diet modification, however, is not necessary for an average individual who remains active and consumes a variety of plant-based proteins throughout the day.